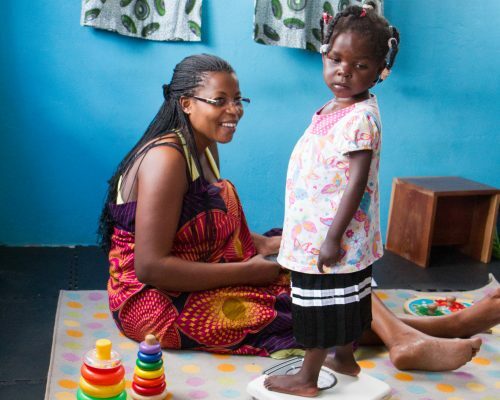 Once a child is assessed, they receive at their local Community Care Center 16-40 hours per month of specialized care, including Speech, Occupational, Physical, Nutritional and Educational Therapies. They also receive regular medical care and familial counseling. In Zambia, there is a significant lack of accessibility to care for children who have intellectual disabilities. Facilities and programs offering necessary therapies and education are few and far between in Lusaka, and therefore kids who have disabilities are often left incredibly marginalized and vulnerable. In 2012, Special Hope Network set up its first two Community Care Centers in Ng’ombe and Garden compounds in order to address these issues. In 2018, two more Community Care Centers were founded in new very people-dense compounds; Mtendere and Kaunda Square. Focusing on the core principles of educational excellence and the intrinsic value of each child’s life, we are working to see these children receive the care they need. Each Community Care Center is within walking distance of children’s homes, therefore decreasing the significant costs of transportation. The Centers are run on a parent training model so that the Center becomes a “one-stop-shop” for everything each child needs, and each topic their parent or caregiver needs to know. And finally, the Centers consider every aspect of the child’s health and well-being that are critical to their growth and development, and each caregiver is trained directly on those topics.